Well, I have been writing and rewriting this post in my editor for a while, but with the recent call to war on tablesaws espoused by Adam Cherubini over at Popular Woodworking Magazine, (You can read his blog post HERE) it seemed like the time to bring it out, rewrite a little and shine the sun on it. The first confession is that I have not gone a whole complete year without my table saw. It's been about 3 weeks short of that year, but writing the title "49 Weeks Without a Table Saw" didn't really sound euphonious. The other confession is that I didn't walk into this year completely by choice. The year was a consequence of other, bigger, life choices. To make a long story shorter, my family and I moved back home from Maine to Wisconsin in a bit of a whirlwind and we took the first place that was available to move into. A small 2 bedroom upstairs duplex in a converted farmhouse. No garage, no basement for a shop, I had a small 5 foot by 9 foot storage area at the bottom of our stairwell, that still shared floor space with the stairwell. My table saw, router table, joiner, drill press, ect. all went into storage and I decided that it was time to focus on really learning to use hand tools. I had been getting more and more interested in hand tools before we made the move. I already had a starting collection inherited from my wife's grandfather and I picked up a few things I didn't have off eBay, a couple planes and what not. So I readily embarked on the adventure of living mostly electron free in the shop for almost a year. So what lessons have I learned in this year without a table saw? I'm not sure I will be able to answer all of them in one blog article without it rivaling Tolstoy. First would be the obvious, skill based lessons. Sharpening a chisel, plane blade, and a saw. Cutting square and to the line. Planing a board flat and joining the edges. The list goes on and on. Then there would be other skills, less readily tangible, but possibly more valuable. I have a better eye for what is straight and square now, along with the muscle memory I learned sawing came a kind of "sight memory" where I can more readily tell when something's off square, even by a little. I have learned to read and pay more attention the the grain of the wood. It's important in hand planing but it's also important in wood selection, and in deciding which parts of a board to use for which parts of a project. I had read some on grain selection in projects before and just passed it off as something beyond me, but in working on my latest project I have been paying attention to the grain and how it will flow in the piece. It's making a difference in the look and I'm impressed. There are other, more subtle lessons I have retained. Will I stay a hand tool exclusive woodworker, a galoot if you will, forever? That answer is easy, no. I will never give up hand tools now for sure, but I consider myself to be a hybrid woodworker now. If you ask me, in my humble opinion, hybrid woodworking seems to be the most intelligent way to go. It mixes a variety of skills and gives you the most options when tackling a problem. It also gives you the chance to keep things fresh with those options, You don't always have to cut those dados with the router, or with the table saw. With a stair saw and a router plane, you have options. Options are a good thing. What's the point of learning all these hand tool techniques if I don't plan on staying exclusive to hand tools? This seems like a self explanatory question to me but let's explore it for a second anyhow. All these skills I have gathered in the last 12 months have made me a better, and more confident woodworker. For a long time I stood still in my woodworking, exploring the same shapes over and over, but now I feel more confident in my abilities, my eye for design, proportion, and detail, and my horizons are broadening. This year without a table saw has been a year of extreme growth for me as an artist working in wood. The time learning hand tools has made me a better woodworker overall. In truth, as I write this article, I have already moved back from complete galoot to hybrid. 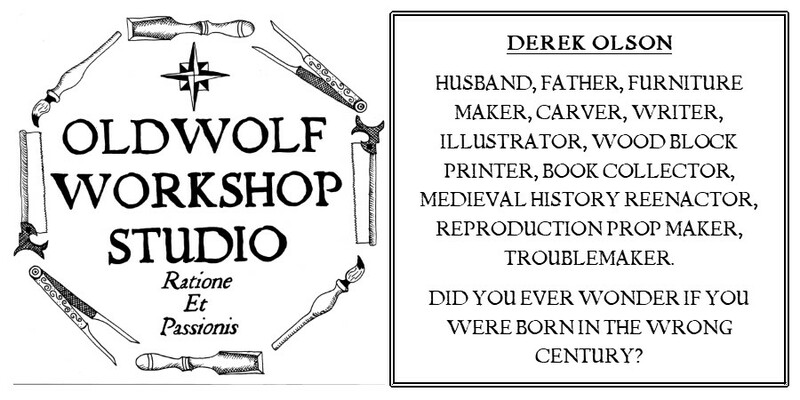 I have recently moved into a new shop space with more room to set up my old electron smashing friends. The project I'm on right now has seen the router and the band saw, and Friday morning, I spent 2 to 3 hours putting my old friend, the table saw, back together, and the white oak has seen her spinning 10 inch blade already. The table saw used to be my go to weapon for anything and everything. I would say for sure that she has lost a good deal of the reverence I used to hold for her, but she still has her place and duty in my shop, and I'm glad to see her back together. I had recorded, and now have severely edited down, a rather long dissertation relating my views on table saws, their necessity, and safety issues in regards to Mr. Cherubini's obvious issues he blogged about. I cannot disagree with some of the points you made sir, I do think that some of the language you used was strong and carried maybe more venom than you really intended, but any of us who read Popular Woodworking Magazine and wait for the next Arts & Mysteries article could have anticipated your biases, and what else is a blog for but a place to express your views and biases. I like my table saw, I'm not going to give it up, it was the first quality piece of equipment I purchased and it is high on my list. It is so versatile and you can do so many things well on a table saw. more things I think that you can do with any other single piece of equipment. That in itself should earn it some merits. All in all with everything one must respect the power and danger of the tool in question, and have no arrogance or ego when it comes to working with the tool. Notice I did not use the word fear, you should not ever fear a tool, fear will, by itself, get in the way of safety. Not fear but respect. Great post, Derek. I guess I'm a "hybrid" woodworker as well, though my desire for a quiet shop does cause me to lean towards handtools more than some. I chuckle over the responses to Adam's post, however. I guess if one criticizes the center of a "religion", this is understandable. But the truth of the matter is that Adam is correct. The notion that a table saw is "necessary" for woodworking is silly. You've just spent 52..err..49 weeks demonstrating that fact. Cheers --- Larry "aka Woodnbits"
The quieter shop is a great point Larry. Learning to use the hand tools was also learning that I could listen to my radio rather than the business side of my hearing protection. Priceless. The saw dust is something that comes to mind too, seems there was much less of that with the hand tools than with the power tools. Maybe the power tools just throw it around in the air better. And I totally agree that Adam is correct, a table saw is definitely not a necessity. There are very few necessities in life and everything else is a choice. Why do magazines feature it on the top of their lists for must have tools? If I were making the list (and those lists are usually focused on power tools, not all possible tools) I think the table saw would still be a strong argument because of it's versatility and all the things you can do with it. 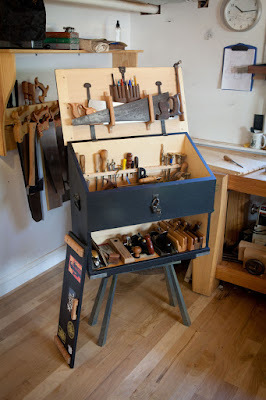 Lord knows how little we really need, having just finished reading "the Joiner and Cabinet Maker" I was impressed with Chris Schwarz's blog post where he listed the tool kit of the joiner represented and came up with 41 tools, all of which could fit on his 6' X 20" workbench. Now that's minimalism! and that can be your choice. As it happens now, my choices are consistently falling somewhere in between. But some of that may be just missing my old friends, it will take some more time for the dust to settle and for me to come to a full realization of where I stand on the bell curve of electrons or sweat. The real reward is I get to make sawdust either way! The really comfortable part is when you reach that balanced state. You are no longer a slave to one way of thinking about how to cut something. The tools just become an extension of you instead of you just being the operator. It really wouldn't have mattered one bit if I had chosen to use a different tool. I was making it and not the tool. "It wouldn't have mattered . . .I was making it and not the tool" David I love this line. Personal responsibility for our own decisions and choices, sounds just like the recurring theme from talking to my daughters. It looks durable and easy to use.